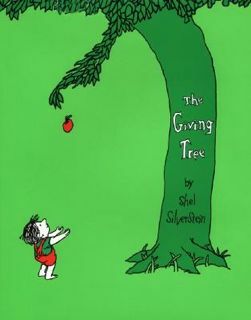 The Giving Tree by Shel Silverstein is one of the most popular classic children's picture books ever written. On the one hand it is a simple story about the enduring friendship between a boy and a tree. However, as you dig deeper you discover many complex themes woven into the text. You can, of course, just enjoy The Giving Tree without over-analysing it. I have read it to my boys many times with very little discussion about what it all could mean. But if you do want to dig deeper, The Giving Tree offers opportunities to talk to your child about love, self-sacrifice, greed, and happiness. It clearly shows the stark contrast between selfishness and selflessness. Many different interpretations have been proposed for this book. Some see it as a bleak portrayal of male chauvinism. Others view it as an environmental tale of man's selfish exploitation of nature. I favour the more positive interpretation that the tree represents unconditional parental love. You can read more about this interpretation below, followed by some suggestions for how you can discuss themes from the book with your child. Keep reading further for ideas of activities you can do with your child based on The Giving Tree. You can also watch The Giving Tree movie spoken by Shel Silverstein, although the quality is not that great. The tree's love for the boy is a selfless love, and she expects nothing in return. She needs only two things in order to be happy - the presence of the boy and the ability to give him what he needs. There is only one time when the tree's happiness is questioned. This is when the boy makes a boat from the tree's trunk and sails away. "And the tree was happy ... but not really." The tree fears the boy will never come back and this makes her sad. Although to the reader the tree seems to sacrifice much for the boy, the tree does not look at it this way. She is happy because she is always able to give the boy just what he needs - apples to sell for money, branches to build a house, her trunk to make a boat, her stump for sitting on. We are told that the boy does love the tree - very much. He continues to come back to the tree throughout his life and it seems to be symbolic that the carved heart with "M.E. + T." remains on the stump until the very end of the story. However, there seems little to suggest the boy appreciates what the tree does for him. He appears selfish and greedy. Despite all that the tree gives him, happiness seems to allude him, although there is a sort of resigned contentment at the end. Whereas before he had always talked of his wants: "I want some money", "I want a house", " I want a boat", now he recognises that such things are perhaps not so important. "I don't need very much now ... just a quiet place to sit and rest." The ultimate message for me is that the key to happiness is making your loved ones happy. They may not always show their love, but they do come back to you. Younger children could find it difficult to understand the full complexities of what is written above, however you can still introduce some of the themes to your child on a simple level. Ask plenty of questions to get your child really thinking about what they have read. Try discussing some of the following points. The Gift of Giving Can you see how the tree is happy but the boy is not? The tree is happy because she is able to give the boy what he wants. The boy gets what he wants and at first he may be happy. However, in the end these gifts do not manage to keep him happy. Giving, and making people that you love happy, can be more rewarding than receiving any gift. Self-Sacrifice The tree gives up a lot for the boy - her apples, branches and even her trunk. To make people that you love happy you may need to give something up which is important to you. For example, to make your brother happy you sometimes need to share your favourite toy with him. Greed Even though the tree is willing to give the boy what he wants, do you think the boy should take it? In the end the tree is left as nothing more than a stump. We should think carefully before taking what people offer us. They might be sacrificing too much in order to try to make us happy. The Giving Tree gives us some examples of what we can use a tree for - apples, building houses and building boats. 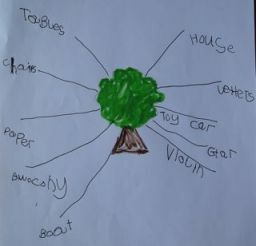 I asked my child whether he could think of other things a tree could be used for. He drew a picture of a tree on a blank piece of paper and then wrote down other uses for a tree that he could think of around the tree. It was a quick, simple activity that helped provide a bit of writing practice. Between the boy's visits to the tree there are long gaps in the story where we can only guess what happens. To help build imagination and communication skills I asked my child to help to fill in the gaps. What happened after the boy went off to the city and sold the apples? How did he meet his wife? How many children did he have? What sort of a house did he build? Where did he sail away to in his boat? Ask a few questions and see what your child comes up with. Have fun sharing The Giving Tree with your child!